Apart from formerly glaciated areas, woolly mammoth remains are abundant in the surficial sediments of the mid and high latitudes of the Northern Hemisphere, including western Europe, northern and eastern Asia, Alaska and the Yukon. There are probably millions of mammoths buried in the permafrost of Siberia alone. The mammoths are found with a wide variety of other mammals, large and small, many of which were grazers. They lived in a grassland environment with a long growing season, mild winters, very little permafrost, and a wide diversity of plants—quite different from the climate in the region today. The mammoths and other animals colonised the region after the Flood during the ice age. The region’s climate during the ice age was ideal for rapid population growth and, in the 600 or so years before their demise, the population had grown to many millions of animals. They were buried in the dust storms that deposited the loess blankets found in those regions today. Some were entombed in a standing position. The good state of preservation of the stomach contents does not call for super-rapid freezing of the carcasses. Rather than food digestion, the mammoth stomach acts as a food storage pouch. The mammoths became extinct when, at the end of the ice age, the climate in the region became more continental, with colder winters, warmer summers, and drier conditions. Mammoths are classified mainly on variables such as molar hypsodonty (height of the crown), number of lamellae (ridges on crown), and enamel thickness. History shows there has been much taxonomic splitting of mammoths, as well as other members of Proboscidea. It is likely that they are all descended from a single created kind.2 In general, there seem to be two main varieties of mammoths on both Eurasia and North America. The woolly mammoth is the smaller variety that generally inhabited the north. The second, more southern variety, from both Eurasia and North America can be lumped together for simplification and referred to as the Columbian mammoth (Mammuthus columbi). Figure 2. 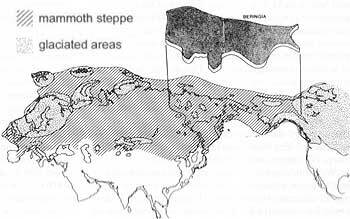 Distribution of woolly mammoth remains, and the mammoth steppe. Glaciated areas are shown speckled. Mammoth steppe is shown hatched. The area referred to as Beringia is shown separately (after Guthrie143). Note that the extent of the northern and eastern boundaries of the Scandinavian ice sheet is controversial. In Siberia, the woolly mammoth inhabited the whole area from the Ural Mountains to the Pacific Ocean. Their east-west distribution is generally uniform, except that they are especially abundant in northeast Siberia.11 Their numbers increase farther north.12,13 Mammoth remains are amazingly abundant on the Lyakhov Islands14 and the other islands of the New Siberian Islands, 230 km north of the Arctic coast.12,15 Frozen mammoth carcasses are usually found eroding out of river banks and along the shore of the Arctic Ocean. How many mammoths are buried in Siberia? There has been much controversy over how many woolly mammoths are frozen in the permafrost of Siberia. A few scientists attempt to downplay the number,21 but practically all observers describe the number in superlatives. The top expert on woolly mammoths in Siberia, Nikolai Vereshchagin, has spent nearly a half century of research on the mammoth fauna. He states that there are many hundreds of thousands of large mammals buried in Siberia22 and also many millions of bones.23 One estimate he made for one region of Siberia would suggest five million mammoths buried.24 Is he exaggerating? It would be conservative, therefore, to conclude that several million mammoths are buried in Beringia. There are many perplexing aspects to the Siberian mammoth finds, including the existence of frozen carcasses and the good preservation of their stomach contents. In addition, a number of the carcasses and skeletons have been unearthed in a general standing position, as if the animal sank in a bog.25–27 The Selerikhan horse was entombed in a general standing position.28 The new Jarkov mammoth was dug up in a standing position. For carcasses to be frozen and the bones and tusks well preserved, quick burial is necessary. But how could all these woolly mammoths have been forced into the rock hard permafrost, which starts about half a meter deep, below the summer melt zone? Figure 3. 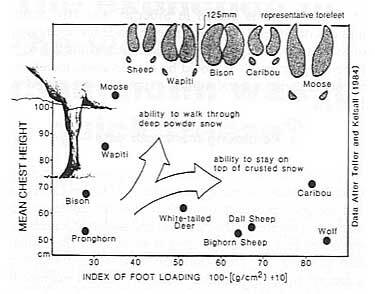 Ability of animals to walk through deep snow or to stay on top of crusted snow depends on foot loading and chest height (after Guthrie).144 The sheep and wolf could not have tolerated deep snow or boggy substrate. How millions of mammoths became entombed in Siberian permafrost really taxes the uniformitarian principle. Why would multitudes of mammoths, plus the many other animals, even want to live in Siberia with its fierce winters and summer bogs? What would these large beasts eat? Siberia today supports only a very few large animals, and these are especially adapted to boggy vegetation and often migrate to escape the full force of winter. Most perplexing of all, how did the woolly mammoths die in Siberia? Was it a quick freeze? Was man the hunter responsible for the demise of the mammoths? Could the animals have lived in Siberia today during the relatively warm summer, perhaps migrating there from the south? The temperature likely would have been pleasant for them, but the environment deadly. Siberia today is in the permafrost zone where up to a metre of the surface melts in the summer. Water pools on the surface forming massive bogs and muskegs, making summer travel difficult, if not impossible, for man and beast.44,45 Tolmachoff 46 states that a few inches of this sticky mud makes the substrate practically impassable for a man, and that a foot or more would probably trap a mammoth. The problem is even more paradoxical in a uniformitarian ice age climate. Ice age climate simulations are of variable quality, depending upon the initial conditions, the approximations employed for complex variables, the particular physics, the number of variables, whether the simulation is a general circulation model, etc. Nevertheless, the better general circulation models demonstrate that the glacial climate of Siberia (assuming uniformitarianism) would have been colder (about 10–20°C) than today: ‘During glacial and stadial stages, the climate of Siberia was much colder than at present.’ 51 This deepens the mystery of why the lowlands of Siberia and Alaska were never glaciated! Such confounding enigmas, not only about the mammoth and the mammoth steppe fauna, but also about the ice age itself, have naturally produced many hypotheses. Early scientists produced a lot of confused writing. For example, Sir Henry Howorth,7,12 who gathered copious observations from Siberian explorers that are considered fairly accurate, believed the mammoths met their demise in a continental-scale flood, but that this flood was not Noah’s Flood. Charles Ginenthal63 provides an updated, more elaborate defense of Velikovsky’s pole shift hypothesis. There is one major problem, among many, with Ginenthal’s and Velikovsky’s hypothesis, and that is a pole shift to a more vertical axis will cool the region, not warm it up. Clark,64 Harold Coffin,73 and myself 74 believe that the woolly mammoth lived and died during the ice age after the Flood. Did Siberian mammoths die in the Flood? There is abundant evidence that the woolly mammoths in Siberia, Alaska and the Yukon died after the Flood. They were truly denizens of the post-Flood ice age. The woolly mammoth is part of an ice age mammoth steppe community that ranged across the non-glaciated portions of the Northern Hemisphere (Figure 2).3 Strong arguments favour a post-Flood origin for the mammoth steppe animals outside of Beringia. The animals are found in: 1) glacial till near the edge of the ice sheets, 2) river flood plain debris, 3) river terraces, 4) tarpits, 5) caves or rockshelters, 6) loess, 7) sinkholes, and 8) peat bogs. There are an estimated 51 predominantly male mammoths that are found in a sink hole at Hot Springs, South Dakota.75 In northwest Siberia, mammoths are found in sediments above glacial till.76 Spear points are associated with or embedded in the remains of mammoths at a dozen or more localities in North America.77 Woolly mammoths are commonly depicted in cave art from Europe eastward to the Russian plain and Ural Mountains.78,79 Ivory carvings are rather common in early-man sites in southern Siberia.80 More than 70 mammoth bone huts have been discovered on the Central Russian Plain.81,82 Such surficial features and deposits would be virtually impossible to form during the Flood and must be post-Flood. To isolate the woolly mammoths in Beringia for a special catastrophic extinction during the Flood, while ignoring the fate of the remainder of the post-Flood mammoth steppe fauna does not make sense. Mammoth remains in the northern hemisphere are associated with events during the ice age. However, uniformitarian ice age models cannot explain the mammoths, or even the ice age itself. The August 18–25, 1997, issue of US News & World Report had a long series of articles on eighteen great mysteries of science. One of those mysteries is: ‘What causes ice ages?’ 88 The June 1996 issue of the popular earth science magazine Earth, reported on a new theory of the ice age. Daniel Pendick89 starts his article titled ‘The dust ages’ by saying: ‘If they hadn’t actually happened, the ice ages would sound like science fiction’. 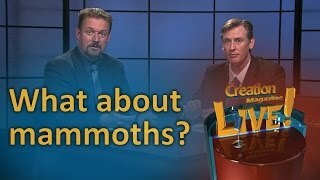 However, the unique creationist post-Flood ice age offers a reasonable solution for the mammoth mysteries. Figure 4. Effect of volcanic dust on cooling of continental interiors. Straight lines are solar radiation, partly reflected back to space by dust and aerosols. Wavy lines are infrared radiation. The result is the inverse of the greenhouse effect. The elephant reproductive rate can vary significantly.92 Elephants do not reach sexual maturity until age 10 to 23.93 They live 50 to 60 years. Eltringham94 states that generally, elephants produce a calf at intervals of four to five years with twins 1.35 % of the time. However, some have suggested that elephants can give birth every two to three years, and there is a case of a zoo elephant giving birth two years and five months after its first birth.95 The reproductive rate is especially enhanced in a favourable environment as when the population is low or the animals are being hunted regularly.92,96–99 There are no natural enemies for a mature elephant, except man,100 but calves are subject to predation.So, mammoths have the potential to increase rapidly following the Flood. Based on doubling rates of 10 years101 and 25 years91 observed in Africa, there would be (assuming ideal circumstances with no predation or calf mortality) 2.1 million mammoths in 300 years or 8 million mammoths in 550 years,102 respectively. In other words, there should be no problem for the population of woolly mammoths to reach many millions toward the end of the ice age some 600 years after the Flood. The post-Flood rapid ice age would have had milder winters and cooler summers with little if any permafrost, mainly because the Arctic and North Pacific Oceans were warm, and ice-free.55 It would not have been the formidable landscape observed today or deduced from uniformitarian ice age expectations. Since the lowlands of Beringia were not glaciated, another uniformitarian conundrum, Beringia would have been a favourable environment for many mammals. Of all the questions related to the mammoths, their extinction has been the most perplexing. It was not only mammoths that became extinct at the end of the ice age, but also many other large animals. Why? We will first discuss their extinction in Siberia and then the extinction of the mammoths and other ice age mammals on whole continents or worldwide. Were woolly mammoths quick-frozen in Siberia? Creationist quick-freeze advocates32,69 postulate that the quick-freeze was directly related to the Flood. However, as previously discussed in the section ‘Did Siberian mammoths die in the Flood?’ the evidence is strong that the Siberian mammoths are buried in post-Flood sediments associated with the ice age. All the arguments presented in that section, such as the mammoths of Beringia being part of one Northern Hemisphere ice age fauna, would apply against the quick-freeze hypothesis. Figure 5. Headless horse in mine shaft indicates that some time elapsed between when the animal was trapped and final burial. 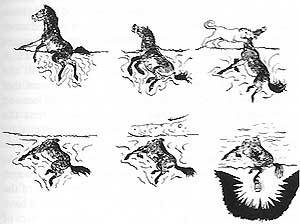 Guthrie’s cartoon145 speculates how the horse was trapped in a bog with its head and neck exposed, which was subsequently eaten by a carnivore. The sixth picture illustrates how the legs of the horse protruded into the mine shaft. One of its hind legs was used to attach cables and hang lanterns. The horse could have just as easily been mired in wind-blown dust as in a bog. Indeed, the horse was found in loam, sandy loam and sand with a steppe-like sporo-pollen complex,146 typical of wind-blown deposits and vegetation. There are other arguments against the quick-freeze hypothesis. 2. The carcasses are often partially decayed with fly pupae and display signs of scavenging,3,79,106,107 not expected during a quick-freeze. 3. The unique condition of several of the carcasses, such as the famished condition of Dima and the headless Selerikhan horse (Figure 5),3,83 indicate some time elapsed before final burial. 4. For some of the carcasses, death appears to have occurred at different times of the year.83,108 A quick-freeze during the Flood, especially as advocated by some creationists, would have occurred in a single instant. 5. The characteristics of the permafrost that entombs the carcasses and bones, show that it was not dumped quickly from above. It is doubtful that ice wedges would form during a quick drop of ice or hail from above. How are the stomach contents explained? Further evidence that the stomach contents should not necessarily decay completely upon death is provided by the preserved stomach contents of mastodons found in North America. Preserved vegetation from the gastrointestinal tracts of mastodons, which are generally found in former peat bogs, have occasionally been reported from the northeast United States.113–115 Recently, the skeleton of a mastodon was discovered within peat on top of an ice age end-moraine in Ohio.115 The remains yielded a discrete, cylindrical mass of plant material found in association with the articulated vertebrae and ribs. Thus a quick chill is not needed to explain the partially preserved stomach contents of the mammoth carcasses. Near the end of the ice age, as the ocean surface temperature cooled at mid and high latitude, and evaporation slowed, the equable ice age climate would have changed to a drier, more continental climate with more seasonal extremes.116 Permafrost would begin developing in Beringia, and the substrate would become boggier in summer. As the climate became more continental during deglaciation, many animals in Siberia would tend to migrate closer to the Arctic Ocean, where the waters were still unfrozen and the climate would have been less continental. However, the changing climate finally caught up with them and they ended up buried in the permafrost that has continued to this day. With this climatic change, there are a number of ways the mammoths and other animals could have died and become interred into the permafrost. One is by becoming trapped in bogs.73 I once thought the cold and wind, itself, could have simply killed them off,117 but it is probable that the mammoths could have endured much cold. I am sure some of the animals were trapped by the flooded rivers draining ice sheets and were buried in fluvial or lacustrine deposits.83,118 Upon further investigation, I now believe the vast majority of the mammoths and other mammals died and were interred into the permafrost by none of the above mechanisms. I believe the secret to their demise and burial can be found in the type of sediment surrounding the woolly mammoths. What type of sediment makes up the yedomas and muck? There has been much controversy and a number of hypotheses on the origin of this sediment. There is now general agreement that the yedomas and muck are loess—a wind-blown silt!121,123–127 Much data support the wind-blown origin of this sediment. The loess is also rich in ground ice and ice wedges. The ground ice formed by a segregation process in which layers and lenses of ice, sometimes clear and sometimes inter-mixed with sediment, developed within the silt.128–130 The loess is not thousands of feet deep in Siberia and Alaska, as some have thought, but is a relatively thin veneer that is widespread in Beringia.123,125,131,132 Some of the loess, especially in Alaska, has been reworked by downslope mass flow. Redeposition of the loess has broken and twisted the vegetation and disarticulated mammal bones, and this has inspired Velikovsky and others to suggest exotic catastrophes. In the post-Flood ice age model, strong wind would have characterised the big chill and dessication during deglaciation.133 In a dry environment, this wind would have picked up and transported large quantities of silt and sand. Abundant wind-blown material is observed as relic features of the ice age in the Northern Hemisphere. Copious wind-blown dust even occurs in the ice age portion of the Greenland and Antarctica ice cores. It is known that mammoths and other mammals are entombed in loess in other areas.122,134–136 Thus, it seems likely that the mammoths in Beringia were mostly killed and buried by dust storms. The animals thrived during the ice age because the temperatures were more equable with cool summers and milder winters. (Note that much of the continental land mass was never covered by ice sheets, even during the ice age.) The disharmonious associations of plants and animals all over the Northern Hemisphere during the ice age are evidence of this equable climate. But, this equable climate ended during deglaciation, and the climate became more continental with colder winters and warmer summers. The existence of ice sheets, the development of sea ice and eventually a cooler ocean than today, would have resulted in less evaporation and a drier climate. The cold winters and dry climate would stress the animals all across the Northern Hemisphere. The larger mammals would have been especially susceptible to drought. Thus climate change likely was the main cause of the end-of-the-iceâ€‘age extinctions. The reason the large animals did not die out at the end of previous glaciations is because there were no previous glaciations.142 Man likely aided the extinction process by harvesting weakened animals. Carcasses and bones of woolly mammoths in Siberia, Alaska, and the Yukon have been difficult to explain. The mammoth remains are abundant over the mid and high latitudes of the Northern Hemisphere, except in formerly glaciated areas. There are probably millions of them buried in the permafrost of Siberia alone. A wide variety of other mammals, large and small, accompanied the mammoth. Many of these animals are grazers, implying that the paleoenvironment of Beringia was a grassland with a wide diversity of plants. This diversity of plants and animals points to a longer growing season with milder winters and very little permafrost. This paleoenvironment is contrary to what is observed in Beringia today, with its very cold winters and boggy substrate in summer. Scientists constrained by uniformitarian thinking seem to face conundrum after conundrum in regard to the life and death of the woolly mammoth in Beringia, as well as by the ice age itself. A uniformitarian ice age climate would have been even colder still. It is difficult to conceive that the woolly mammoth and all the other animals could have lived in Siberia under these conditions. It is obvious the uniformitarian assumption does not apply. Thus, many hypotheses, both creationist and non-creationist, have been proposed. Creationists have been divided on whether the woolly mammoth perished in the Flood or afterwards. A number of creationist hypotheses involve a quick freeze, because it was thought that the state of preservation of the carcasses with only half-decayed vegetation in their stomachs demanded it. Reasonable explanations for all these mysteries are available within the context of a unique post-Flood ice age. Astral catastrophies, pole shifts and other such exotic hypotheses are not needed. A quick freeze is also not necessary, and besides, there is much data against the hypothesis. There is strong evidence that the woolly mammoth died after the Flood during the ice age. There was enough time for the population of the mammoths to have grown to millions by the end of the ice age. Furthermore, this unique ice age was characterised by colder summers and warmer winters, resulting in a more favourable habitat for the animals in the non-glaciated lowlands of Beringia. The animals became extinct at the end of the ice age because the climate changed to a more continental climate, with colder winters and warmer summers, and drier conditions. There is copious data against the hypothesis of a quick freeze. The state of preservation of the stomach contents are better explained by the post-gastric digestive system of elephants in which the stomach is mainly a holding pouch for vegetation. The question of how the mammoths died in Beringia can be answered by analysing the sediments surrounding the mammoths and other animals. They are mostly entombed in yedomas in Siberia and muck in Alaska. These are mostly loess and reworked loess. It is postulated that the animals were buried by dust storms, whether they met their demise directly by wind-blown silt or not. The carcasses and other perplexing data associated with the carcasses, such as death by suffocation, entombment while in a standing position, and broken bones, can be explained by death during gigantic dust storms and post-mortem shifting of the permafrost. 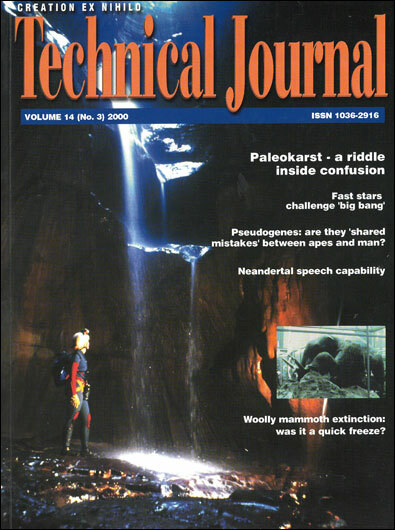 I thank Mark Russell, Kirk Toth, Dave Jolly, and Glen Wolfrom for providing hard-to-obtain literature and for providing data on the woolly mammoths. I also thank Tas Walker and others at CMI–Australia, for their valuable suggestions and Harold Coffin for reviewing the manuscript and suggesting a number of changes. Was there enough time for thick permafrost to form? Why no mention of the Ice Age in the Bible? Stone, R., Siberian mammoth find raises hopes, questions, Science 286:876–877, 1999. Return to text. Sarfati, J., Mammoths—riddle of the Ice Age , Creation 22(2):10–15, 2000; p. 11. Return to text. Kahlke, R.D., The History of the Origin, Evolution and Dispersal of the Late Pleistocene Mammuthus-Coelodonta Faunal Complex in Eurasia (Large Mammals), Mammoth Site of Hot Springs, South Dakota Inc., Hot Springs, SD, 1999. Return to text. Charlesworth, J.K., The Quaternary Era, Edward Arnold, London, p. 1237, 1957. Return to text. Ray, C.E., Polar bear and mammoth on the Pribilof Islands, Arctic 24(10):9–18, 1971. Return to text. Howorth, H.H., The Mammoth and the Flood—An Attempt to Confront the Theory of Uniformity with the Facts of Recent Geology, Sampson Low, Marston, Searle & Rivington, London, p. 54, 1887, reproduced by The Sourcebook Project, Glen Arm, MD. Return to text. Dixon, E.J., Pleistocene proboscidean fossils from the Alaskan continental shelf, Quaternary Research 20:113–119, 1983. Return to text. Mol, D., van den Bergh, G.D. and de Vos, J., Fossil Proboscideans from The Netherlands, the North Sea and the Oosterschelde Estuary; in: Haynes, G., Klimowicz, J. and Reumer, J.W.F. (eds), Mammoths and the Mammoth Fauna: Studies of an Extinct Ecosystem, Proceedings of the First International Mammoth Conference, Jaarbericht Van Het Natuurmuseum, Rotterdam, pp. 119–140, 1999. Return to text. Whitmore, Jr, F.C., Emery, K.O., Cooke, H.B.S. and Swift, D.J.P., Elephant teeth from the Atlantic continental shelf, Science 156:1477–1481, 1967. Return to text. Baryshnikov, G., Haynes, G. and Klimowicz, J., Mammoths and the mammoth fauna: introduction to the studies of an extinct ecosystem; in: Haynes et al., Ref. 9, p. 5. Return to text. Howorth, H.H., The mammoths in Siberia, Geological Magazine 7:550–561, 1880. Return to text. Digby, B., The Mammoth and Mammoth-Hunting in North-East Siberia, H.F. & G. Witherby, London, p. 14, 1926. Return to text. Baryshnikov et al., Ref. 11, p. 5. Return to text. Nordenskiöld, A.E., The Voyage of the Vega round Asia and Europe, MacMillan and Co., London, pp. 149, 155, 1883. Return to text. Hoffman, R.S., Different voles for different holes: Environmental restrictions on refugial survival of mammals; in: Scudder, G.G.E. and Reveal, J.L. (eds), Evolution Today, Proceedings of the Second International Congress of Systematics and Evolutionary Biology, Carnegie-Mellon University, Pittsburgh, PA, pp. 25–45, 1981. Return to text. Harington, C.R., Quaternary vertebrate faunas of Canada and Alaska and their suggested chronological sequence, Syllogeus 15, National Museum of Canada, Ottawa, 1978. Return to text. Harington, C.R., Vertebrates of the last interglaciation in Canada: a review with new data, Géographie physique et Quaternaire 44:375–387, 1990. Return to text. Stuart, A.J., Mammalian extinctions in the Late Pleistocene of northern Eurasia and North America, Review of Biology 66:453–562, 1991. Return to text. Howorth, Ref. 7, p. 113. Return to text. Farrand, W.R., Frozen mammoths and modern geology, Science 133:729–735, 1961; p. 733. Return to text. Vereshchagin, N.K., The mammoth ‘cemeteries’ of north-east Siberia, Polar Record 17(106):3–12, 1974; p. 3. Return to text. Vereshchagin, N.K., An experiment in the interpretation (visual assessment) of mammalian bones from sediments of the Quaternary Period; in: Steadman, D.W. and Mead, J.I. (eds), Late Quaternary Environments and Deep History: A Tribute to Paul S. Martin, The Mammoth Site of Hot Springs, South Dakota Inc., Hot Springs, SD, pp. 61–64, 1995; p. 62. Return to text. Stewart, J.M., Frozen mammoths from Siberia bring the ice ages to vivid life, Smithsonian 8:60–69, 1977; p. 68. Return to text. Howorth, Ref. 7, pp. 61, 185. Return to text. Digby, Ref. 13, pp. 97–103. Return to text. Pfizenmayer, E.W., Siberian Man and Mammoth, Blackie & Sons, London, p. 7, 1939. Return to text. Guthrie, Ref. 3, p. 32. Return to text. Digby, Ref. 13, p. 54. Return to text. Tolmachoff, I.P., The carcasses of the mammoth and rhinoceros found in the frozen ground of Siberia, Transactions of the American Philosophical Society 23:11–74, 1929; p. 35. Return to text. Farrand, Ref. 21, p. 734. Return to text. Brown, W., In the Beginning: Compelling Evidence for Creation and the Flood, 6th edition, Center for Scientific Creation, Phoenix, AZ, p. 118, 1995. Return to text. Oard, M.J., Beware of paleoenvironmental deductions, CEN Tech, J. 13(2):13, 1999. Return to text. Guthrie, R.D., Mammals of the mammoth steppe as paleoenvironmental indicators; in: Hopkins, D.M., Matthews, Jr., J.V., Schweger, C.E. and Young, S.B. (eds), Paleoecology of Beringia, Academic Press, New York, NY, pp. 307–326, 1982; p. 313. Return to text. Bocherens, H., Pacaud, G., Lazarev, P.A. and Mariotti, A., Stable isotope abundances (13C, 15N-fix) in collagen and soft tissues from Pleistocene mammals from Yakutia: implications for the palaeobiology of the mammoth steppe, Palaeogeography, palaeoclimatology, palaeoecology 126:31–44, 1996; p. 31. Return to text. Zimov, S.A., Chuprynin, V.I., Oreshko, A.P., Chapin III, F.S., Reynolds, J.F. and Chapin, M.C., Steppe–tundra transition: a herbivore-driven biome shift at the end of the Pleistocene, American Naturalist 146:765–794, 1995; p. 768. Return to text. Sher, A.V., Late-Quaternary extinction of large mammals in northern Eurasia: a new look at the Siberian contribution; in: Huntley, B., Cramer, W., Morgan, A.V., Prentice, H.C. and Allen, J.R.M. (eds), Past and Future Rapid Environmental Changes: The Spatial and Evolutionary Responses of Terrestrial Biota, Springer, NY, pp. 319–339, 1997; p. 325. Return to text. Guthrie, Ref. 34, pp. 322–324. Return to text. Howorth, Ref. 12, p. 553. Return to text. Guthrie, Ref. 34, p. 309. Return to text. Guthrie, Ref. 3, p. 201. Return to text. For example, Ukraintseva, V.V., Vegetation of warm Late Pleistocene intervals and the extinction of some large herbivorous mammals, Polar Geography and Geology 4:189–203, 1981. Return to text. Oard, M.J., The Weather Book, Master Books, Green Forest, AR, p. 13, 1997. Return to text. Vereshchagin, N.K. and Baryshnikov, G.F., Quaternary mammalian extinctions in Northern Eurasia; in: Martin, P.S. and Klein, R.G. (eds), Quaternary Extinctions: A Prehistoric Revolution, University of Arizona Press, Tuscon, AZ, pp. 483–516, 1984; p. 492. Return to text. Digby, Ref. 13, pp. 15–16. Return to text. Tolmachoff, Ref. 30, p. 57. Return to text. Chapin, III, F.S., Shaver, G.R., Giblin, A.E., Nadelhoffer, K.J. and Laundre, J.A., Responses of Arctic tundra to experimental and observed changes in climate, Ecology 76(3):694–711, 1995; p. 694. Return to text. Sher, Ref. 37, p. 322. Return to text. Vereshchagin, N.K. and Baryshnikov, G.F., Paleoecology of the mammoth fauna in the Eurasian Arctic; in: Hopkins et al., Ref. 34, pp. 267–279, p. 269. Return to text. Vereshchagin, Ref. 22, p. 12. Return to text. Arkhipov, S.A., Environment and climate of Sartan maximum and late glacial in Siberia; in: Martini, I.P. (ed. ), Late Glacial and Postglacial Environmental Changes—Quaternary, Carboniferous-Permian, and Proterozoic, Oxford University Press, New York, NY, pp. 53–60, 1997; p. 54. Return to text. Vartanyan, S.L., Garutt, V.E. and Sher, A.V., Holocene dwarf mammoths from Wrangel Island in the Siberian Arctic, Nature 362:337–340, 1993. Return to text. Lister, A.M., Mammoths in miniature, Nature 362:288–289, 1993. Return to text. Long, A., Sher, A. and Vartanyan, S., Holocene mammoth dates, Nature 369:364, 1994. Return to text. Oard, M.J., An Ice Age Caused by the Genesis Flood, Institute for Creation Research, El Cajon, CA, pp. 124–128, 1990. Return to text. Alroy, J., Putting North America’s end-Pleistocene megafaunal extinction in context; in: MacPhee, D.E. (ed. ), Extinctions in Near Time—Causes, Contexts, and Consequences, Kluwar Academic/Plenum Publishers, New York, NY, pp. 105–143, 1999; p. 105. Return to text. Velikovsky, I., Worlds in Collision, Pocket Books, New York, NY, 1950. Return to text. Velikovsky, I., Earth in Upheaval, Doubleday & Co., New York, NY, 1955. Return to text. Velikovsky, Ref. 58, p. 13. Return to text. Sanderson, I.T., Riddle of the frozen giants, The Saturday Evening Post, pp. 39, 82, 83, Jan 16, 1960. Return to text. Hapgood, C.H., Earth’s Shifting Crust—A Key to Some Basic Problems of Earth Science, Pantheon Books, New York, NY, 1958. Return to text. Hapgood, C.H., The Path of the Pole, Chilton Book Co., New York, NY, 1970. Return to text. Ginenthal, C., The Extinction of the Mammoth, Forest Hills, New York, NY, 1997. Return to text. Clark, H.W., Fossils, Flood, and Fire, Outdoor Pictures, Escondido, CA, p. 188, 1968. Return to text. Rehwinkel, A.M., The Flood, Concordia Publishing House, Saint Louis, MO, pp. 238–254, 1951. Return to text. Nelson, B.C., The Deluge Story in Stone, Baker Book House, Grand Rapids, MI, 1931. Return to text. Whitcomb, Jr., J.C. and Morris, H.M., The Genesis Flood, Baker Book House, Grand Rapids, MI, p. 288–291, 1961. Return to text. Patten, D.W., The Biblical Flood and the Ice Epoch, Pacific Meridian Publishing Co., Seattle, WA, 1966. Return to text. Dillow, J.C., The Waters Above: Earth’s Pre-Flood Vapor Canopy, Moody Press, Chicago, IL, 1981. Return to text. Dillow, Ref. 69, pp. 311–420. Return to text. Dillow, Ref. 69, pp. 351–353. Return to text. Brown, Ref. 32, p. 111. Return to text. Coffin, H.G. with Brown, R.H., Origin by Design, Review and Herald Publishing Association, Washington D.C., pp. 256–267, 1983. Return to text. Oard, Ref. 55, pp. 86–91, 128–133. Return to text. Agenbroad, L.D., Pygmy (Dwarf) Mammoths of the Channel Islands of California, Mammoth Site of Hot Springs, South Dakota Inc., Hot Springs, SD, p. 27, 1998. Return to text. Sher, Ref. 37, p. 323. Return to text. Saunders, J.J., Blackwater Draws: mammoths and mammoth hunters in the terminal Pleistocene; in: Fox, J.W., Smith, C.B. and Wilkins, K.T., Proboscidean and Paleoindian Interactions, Baylor University Press, Waco, TX, pp. 123–147, 1992; p. 128. Return to text. Stuart, Ref. 19, p. 489. Return to text. Lister, A. and Bahn, P., Mammoths, Macmillan, New York, NY, p. 103, 1994. Return to text. Lister and Bahn, Ref. 79, p. 113. Return to text. Soffer, O., The Upper Paleolithic of the Central Russian Plain, Academic Press, New York, NY, 1985. Return to text. Ward, P.D., The Call of Distant Mammoths—Why the Ice Age Mammoths Disappeared, Springer-Verlag, New York, NY, p. 144, 1997. Return to text. Ukraintseva, V.V., Vegetation Cover and Environment of the ‘Mammoth Epoch’ in Siberia, Mammoth Site of Hot Springs, South Dakota Inc., Hot Springs, SD, pp. 80–98, 1993. Return to text. Dubrovo, N.A., Giterman, R.Ye., Gorlova, R.N. and Rengarten, N.V., Upper Quaternary deposits and paleogeography of the region inhabited by the young Kirgilyakh mammoth, International Geology Review 24(6):621–634, 1982. Return to text. Guthrie, Ref. 3, pp. 7–24. Return to text. Knystautas, A., The Natural History of the USSR, McGraw-Hill, New York, NY, p. 17, 1987. Return to text. Guthrie, R.D. and Matthews, Jr., J.V., The Cape Deceit fauna—early Pleistocene mammalian assemblage from the Alaskan Arctic, Quaternary Research 1:474–510, 1971; p. 474. Return to text. Watson, T., What causes ice ages? US News & World Report 123(7):58–60, 1997. Return to text. Pendick, D., The dust ages, Earth 5(3):22–23, 66–67, 1996; p. 22. Return to text. Keys, D., Catastrophe—An Investigation into the Origins of the Modern World, Ballantine Books, New York, NY, 1999. Return to text. Haynes, G., Mammoths, Mastodonts, and Elephants, Cambridge University Press, New York, NY, 1991. Return to text. Laws, R.M., Parker, I.S.C. and Johnstone, R.C.B., Elephants and Their Habitats—The Ecology of Elephants in North Bunyoro, Uganda, Clarendon Press, Oxford, UK, pp. 204–227, 1975. Return to text. Pilgram, T. and Western, D., Inferring hunting patterns on African elephants from tusks in the international ivory trade, J. Applied Ecology 23:503–514, 1986. Return to text. Eltringham, S.K., Elephants, Blandford Press, Dorset, UK, 1982. Return to text. Eltringham, Ref. 94, p. 86. Return to text. Eltringham, Ref. 94, p. 84–88. Return to text. Lee, P.C. and Moss, C.J., Early maternal investment in male and female African elephant calves, Behavioral Ecology and Sociobiology 18:353–361, 1986; p. 358. Return to text. Haynes, Ref. 91, p. 65. Return to text. Ward, Ref. 82, p. 219. Return to text. Ward, Ref. 82, p. 132. Return to text. Mithen, S., Simulating mammoth hunting and extinction: implications for the Late Pleistocene of the Central Russian Plain; in: Peterkin, G.L., Bricker, H.M. and Mellars, P. (eds), Hunting and Animal Exploitation in the Late Palaeolithic and Mesolithic of Eurasia, The American Anthropological Association, USA, pp. 163–178, 1993; p. 170. Return to text. Sarfati, J., How did millions of mammoth fossils form? Creation 21(4):56, 1999. Return to text. Dillow, Ref. 69, pp. 383–396. Return to text. Tolmachoff, Ref. 30, p. 20. Return to text. Oard, Ref. 55, pp. 128–133. Return to text. Thorson, R.M. and Guthrie, R.D., Stratigraphy of the Colorado Creek mammoth locality, Alaska, Quaternary Research 37:214–228, 1992; p. 221. Return to text. Guthrie, Ref. 3, pp. 1–44. Return to text. van Hoven, W., Prins, R.A. and Lankhorst, A., Fermentative digestion in the African elephant, South African J. Wildlife Research 11(3):78–86, 1981. Return to text. van Hoven, W. and Boomker, E.A., Digestion; in: Hudson, R.J. and White, R.G. (eds), Bioenergetics of Wild Herbivores, CRC Press, Boca Raton, FL, pp. 103–120, 1985. Return to text. Eltringham, Ref. 94, p. 17. Return to text. Haynes, Ref. 91, p. 58. Return to text. Howorth, Ref. 7, pp. 289–303. Return to text. Hapgood, Ref. 61, pp. 257–265. Return to text. Lepper, B.T., Frolking, T.A., Fisher, D.C., Goldstein, G., Sanger, J.E., Wymer, D.A., Ogden III, J.G. and Hooge, P.E., Intestinal contents of a Late Pleistocene mastodont from midcontinental North America, Quaternary Research 36:120–125, 1991; p. 120. Return to text. Oard, Ref. 55, pp. 109–114. Return to text. Oard, Ref. 55, p. 132. Return to text. Vereshchagin, N.K. and Tomirdiaro, S.V., Taphonomic research in permafrost regions: a survey of past and present studies in the former Soviet Union; in: Haynes et al., Ref. 9, pp. 187–198. Return to text. Vereshchagin, Ref. 22, p. 5. Return to text. Kaplina, T.N. and Lozhkin, A.V., Age and history of accumulation of the ‘ice complex’ of the maritime lowlands of Yakutiya; in: Velichko, A.A. (ed. ), Late Quaternary Environments of the Soviet Union, University of Minnesota Press, Minneapolis, MN, pp. 147–151, 1984. Return to text. Fraser, T.A. and Burn, C.R., On the nature and origin of ‘muck’ deposits in the Klondike area, Yukon Territory, Canadian J. Earth Sciences 34:1333–1344, 1997; p. 1333. Return to text. Vereshchagin, Ref. 22, p. 6. Return to text. Péwé, T.L., Journaux, A. and Stuckenrath, R., Radiocarbon dates and late-Quaternary stratigraphy from Mamontova Gora, unglaciated Central Yakutia, Siberia, USSR, Quaternary Research 8:51–63, 1977. Return to text. Tomirdiaro, S.V., Evolution of lowland landscapes in Northeastern Asia during Late Quaternary time; in: Hopkins et al., Ref. 34, pp. 29–37. Return to text. Péwé, T.L. and Journaux, A., Origin and character of loesslike silt in unglaciated South-Central Yakutia, Siberia, USSR, US Geological Survey Professional Paper 1262, US Government Printing Office, Washington, D.C., 1983. Return to text. Pielou, E.C., After the Ice Age—The Return of Life to Glaciated North America, University of Chicago Press, Chicago, IL, p. 151, 1991. Return to text. Sher, A., Is there any real evidence for a huge shelf ice sheet in East Siberia? Quaternary International 28:39–40, 1995. Return to text. Taber, S., Perennially frozen ground in Alaska: its origin and history, Geological Society of America Bulletin 54:1433–1548, 1943. Return to text. Guthrie, Ref. 3, pp. 19–22. Return to text. Michel, F.A., The relationship of massive ground ice and the Late Pleistocene history of Northwest Siberia, Quaternary International 45/46:43–48, 1998. Return to text. Péwé, T.L., Quaternary Geology of Alaska, US Geological Survey Professional Paper 835, US Government Printing Office, Washington, D.C., pp. 34–43, 1975. Return to text. Preece, S.J., Westgate, J.A., Stemper, B.A. and Péwé, T.L., Tephrochronology of late Cenozoic loess at Fairbanks, central Alaska, Geological Society of America Bulletin 111:71–90, 1999; p. 71. Return to text. Oard, Ref. 55, pp. 109–119. Return to text. Howorth, Ref. 7, p. 102. Return to text. Schultz, C.B., The stratigraphic distribution of vertebrate fossils in Quaternary eolian deposits in the midcontinent region of North America; in: Schultz, C.B. and Frye, J.C. (eds), Loess and Related Eolian Deposits of the World, University of Nebraska Press, Lincoln, NB, pp. 115–138, 1968. Return to text. Sutcliffe, Ref. 106, p. 43. Return to text. Guthrie, Ref. 3, pp. 4, 31. Return to text. Sher, Ref. 127, p. 31. Return to text. Vereshchagin and Tomirdiaro, Ref. 118, p. 188. Return to text. Pfizenmayer, Ref. 27, p. 104. Return to text. Oard, Ref. 55, pp. 127–128. Return to text. Oard, Ref. 55, pp. 135–166. Return to text. Guthrie, Ref. 3, p. 254. Return to text. Ukraintseva, Ref. 42, pp. 188–189. Return to text.